I first saw Israeli-Canadian painter Melanie Daniel's work in Echo Shield, her 2012 solo show at Asya Geisberg gallery. I had a frustrating experience with it: it was interesting work which I liked and wanted to write about. But I lacked the conceptual framework to describe what I was seeing. Here's the title piece from that show. 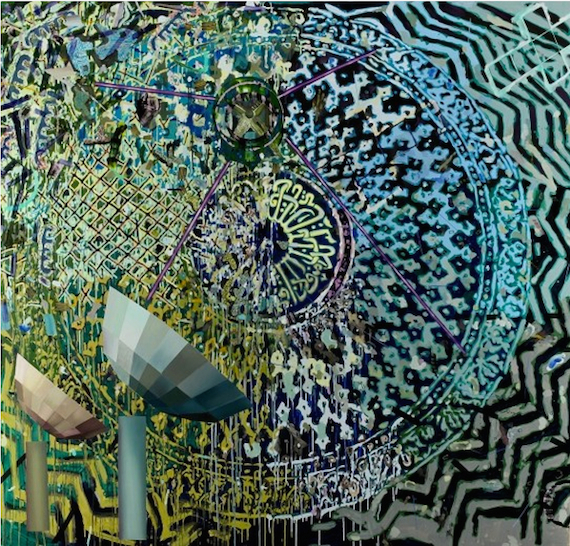 Melanie Daniel, Echo Shield, 2012, oil on canvas, 67"x67"
I thought about this painting for a long time; long enough to teach myself how to speak about it. It is visually dense, but it is also conceptually dense. Its patterning and crowding give it an air of anxiety, of a tooth-grinding tension so intense as to have reached the point of paralysis. This overtone informs the many-layered content. On an explicit level, the satellite dishes raise the topics of telecommunication, signals, and surveillance. There are two dishes on the lower left, but the center of the image is also a dish - the receiver thrusts forward out of the image plane, and the dish itself lies behind. But it is not a dish alone; the Arabic script and black and blue pattern are indicative of the interior of the dome of a mosque. Daniel has produced one of those strange dream-unifications, a mosque-dome/satellite-dish which does not cease to be either thing. The fine filigree of high contrast fields throughout the piece - the swarming tiles, and zig-zags, and fence on the center left, and jumbled debris in the northwest corner - answer to the calligraphic qualities of the Arabic architecture Daniel quotes, but also to the landscape of Israel itself. Israel is an arid land. In its agricultural areas, it is given to fields where each clod of earth casts its own dark little shadow upon the sunbaked soil. The Israeli landscape can be painfully sharp in precisely the packed, high-contrast way Daniel catches in the painting. The cumulative effect, then, is of an Israeli in anguish over the present and future of Israel. Her vision of the very constituent parts of the state is in flux, but whichever version of its identity she turns to, she finds the same unyielding, parched array. She has run out of comfort. 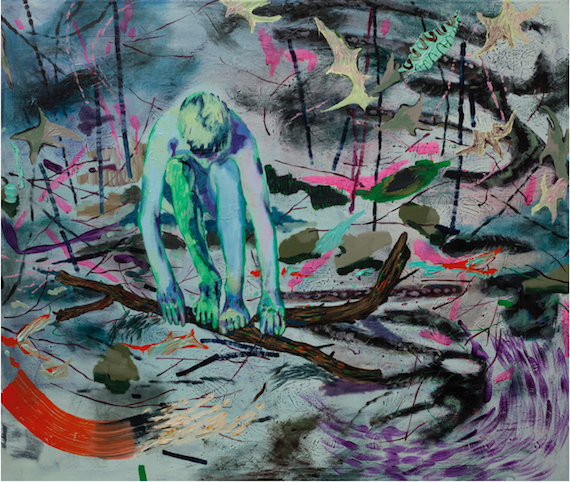 Step forward two years to Lotus Eaters, her new solo at Asya Geisberg, and what do we find? As the title suggests, a loosening of approach has taken place. The new title painting is as follows. 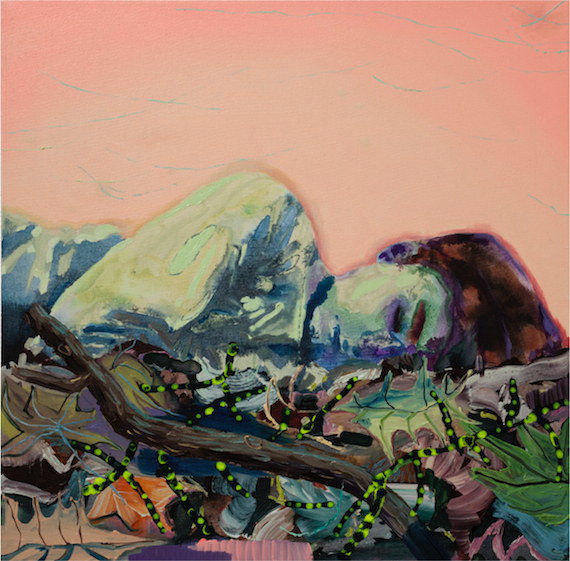 Melanie Daniel, Lotus Eater, 2014, oil on canvas, 27"x26"
Observe how Daniel personalizes the Greek myth of the lotus eaters, whose diet stupefied them in a dreamy state. The overpacked world of Echo Shield is referenced in the bottom third of the painting, but it is transformed here into a seething plant life, a loose evocation of the lotuses in question. The dreamer lies above them. Above him is a virtually empty pink sky, the relaxed world of the dream. Daniel no longer seeks resolution inside of the anxious world she painted before. She rephrases that world as the food of dreams, and takes refuge in a space apart, a personal space. A personal space composed of dreams and memories forms the basis for most of the work in the show. Consider Sky's Low Silver. 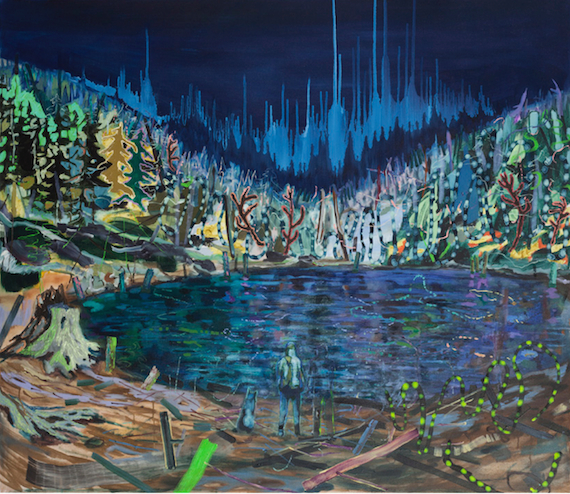 Melanie Daniel, Sky's Low Silver, 2014, oil on canvas, 51"x59"
Two human figures, one of them a ghost, and a dog, stand on the shore of a pond. Across the pond is a phantasmagoric forest and an uncanny aurora of a sky, formed from inverted drips. Daniel displays the horror vacui characteristic of her earlier work, but as in Lotus Eater, she partly undoes it, with the loosened foreground field and the nearly featureless upper sky. As with Lotus Eater, these reduced regions provide breathing room. We can relax into a sense of the magic of an evening by the pond. This magic is aligned strongly with memory; such magic is almost never experienced in the moment, almost always in recollection of a particularly profound evening. The continued unreality of Daniel's system of representation, even as her subjects of representation become more familiar, raises a topic I think is worth mentioning. Daniel has walked back from the brink of mania and stasis which threatened to consume her in Echo Shield. But as an artist, there is never any going backward from anything. There is only forward. Daniel's new focus on the simple pleasures of personal experience - pleasures so simple as to be virtually universal - would analytically tend to suggest her means of expression should move toward the classical as well. And yet we find her landscapes, and lines, and colors, as strange as ever. Melanie Daniel, Pale Boy and Stick, 2014, oil on canvas, 34"x40"
How recognizable this scene is! Shirtless summer heat, and that intense concentration of youth which does not notice the awkward position the body folds into, and the joys of finding really good sticks. These are elemental things, easily forgotten and easily recalled. And yet they take place here in a land of purple and red marks, of blue grounds, of absurd hot pink touches and green fragments - they take place in a new stage, in fact, of Daniel's own universe of swirling fragments and beckoning spaces. We see in this that art is both opposed to time, and like time. Art can return pieces of the irretrievable past to us. But in its making, the artist is constrained to build upon what has come before. She cannot revert. When she reconstitutes the past, she can only use the materials of the present. This conflict between the grasping for the past, and the impositions of the present, takes place in much art, but it is central to Lotus Eaters, because Daniel cannot help stylizing her work so radically; and because her clarity of vision so gently but totally converts that stylization into a natural means of returning to the peace she has been without for such a long time.